Inspired by the best of British and celebrating the joys of country living, the Deer Park Country House is set in 80 acres of magnificent grounds, including an Italian garden, walled gardens and outdoor Mediterranean kitchen. The dog-friendly, four-star boutique hotel is ideal for all occasions from weddings, corporate events and exclusive hire for full house take-overs. Originally a squire’s mansion dating back to 1721, the Georgian house known as Deer Park Country House went through a multi-million pound redevelopment in 2016. 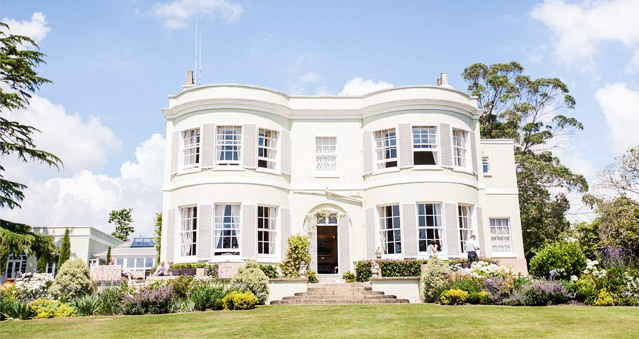 With the addition of a stunning orangery, luxury thatched tree house, motor house and executive detached house, the Deer Park Country House is now considered one of the most unique and exclusive venues in England, situated in one of Devon’s most breathtaking estates. Within the house, lounges alive with crackling fireplaces, squashy sofas and armchairs invite you in, while large conservatory doors lead out onto the terrace with that jaw-dropping view. The décor cries out for a martini glass to be sipped from, and luckily enough there’s an extensive cocktail menu to provide just the elegant tipple. Guests are spoilt for choice, with 32 fabulous bedrooms and a self-catering cottage. For those looking for an indulgent treat, there’s a luxury thatched treehouse bursting with life’s greatest pleasures, from the wood-burning stove to a free-standing roll-top bath. Deer Park’s handsome double AA rosette winning restaurant, Loxton’s, is a destination for locals and residents alike. There’s something for everyone, from exquisite four-course tasting menus, to melt-in-the-mouth pizzas cooked in Deer Park’s outdoor clay oven, or perhaps a slow-roasted succulent Devonshire pig cooked on a spit. The team of chefs rely on the local area for ingredients; fruit, vegetables and herbs are grown in Deer Park’s own walled garden, fishy highlights on the menu can be credited to the nearby shore. Every scrap on the menu is prepared in-house. The beautiful venue is only a 1 Hour flight from London City and 20 mins from Exeter Airport. If you would like to hold your next event at Deer Park Country House contact us on 0207 1676 717 or email us info@rightangleevents.co.uk.